Zika virus is a flavivirus spread mostly by the bite of an infected Aedes species mosquito. The best way to prevent Zika is to protect yourself from mosquito bites. The Zika virus is an especially serious virus for pregnant women and their unborn children, causing such abnormalities called Congenital Zika Virus Syndrome, which can be as severe as microcephaly with partially collapsed skull; thin cerebral cortices with subcortical calcifications; macular scarring and focal pigmentary retinal mottling; congenital contractures; and marked early hypertonia and symptoms of extrapyramidal involvement. A baby born with Congenital Zika Virus Syndrome. To learn more about the virus itself, please see the Centers for Disease Control and Prevention (CDC) Zika Web site. The CDC recommends clinicians responsible for the diagnosis and care of infants and children consult the “Additional Considerations for the Evaluation and Management of Infants with Possible Congenital Zika Virus Infection” guidance which includes new considerations for the evaluation of infants with possible congenital Zika virus infection including 1) testing of cerebrospinal fluid, 2) testing of infants whose mothers have possible Zika virus exposure during pregnancy but were not tested or were tested more than 12 weeks after maternal exposure or symptoms, 3) testing beyond 2 days of life, 4) imaging, and 5) maintaining a level of suspicion throughout the infected baby’s early years. For more information, see the CDC Evaluation and Testing Web page. 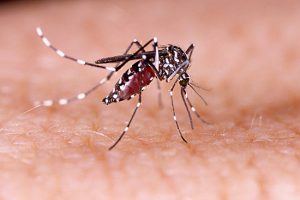 To understand more about Zika virus infection during pregnancy and congenital Zika virus infections, the CDC has established the US Zika Pregnancy and Infants Registries. The CDC is asking pediatricians to contribute to the registries by reporting babies with suspected congenital Zika cases to state, tribal, local or territorial health departments to facilitate testing. Members of the AAP can find state-specific contact information here. The registries collect follow-up information on all reported infants born to women with laboratory evidence of possible Zika virus infection (regardless of whether they have symptoms) and periconceptionally, prenatally, or perinatally exposed infants born to these women, including infants who appear healthy at birth. Infants born to women with Zika virus are included up to 1 year. For questions about the registry please email ZikaPregnancy@cdc.gov or call 770-488-7100. A CDC Vital Signs report shows that not all infants are receiving the proper postnatal testing. It is very important to report cases and follow up care to the US Zika Pregnancy and Infant Registries. Data collected through surveillance efforts here in Louisiana will help guide recommendations for clinical care and testing, prevention guidelines, and service delivery for pregnant women and children affected by Zika virus. The LA state or local health department will work with health care providers to collect information on these patients at periodic intervals throughout the baby’s first year of life. The CDC and the March of Dimes created the Zika Care Connect Web site which provides a searchable network of health care professionals who care for patients affected by Zika. These health care professionals receive the latest medical information from the CDC, and this and other project support enables them to care for patients with Zika based on the most up-to-date information. If an infant has been diagnosed with a birth defect, such as those associated with Zika virus exposure, these infants and their families may be eligible to receive care coordination and child development services through the Louisiana Department of Health (LDH). Please take steps to learn more about the services available to children through the Children with Special Healthcare Needs Program. Includes quick reference information for pediatricians about screening, testing, evaluation and management of infants with suspected or confirmed Congenital Zika Virus Infection. Videos and handouts that provide guidance for providers and parents for the psychosocial support that will be needed when facing a child born with congenital Zika virus syndrome. Here are links for a patient video that is open access and part of the ACOG Zika tool kit. English version can be viewed here: http://www.acog.org/zikatoolkit or https://vimeo.com/183692399. With all of coverage in the news about the Zika virus, it is understandable that parents have questions. Here are the facts you need to know about this virus. An expecting parent’s number one wish is for a happy, healthy baby. The spread of Zika virus to the United States and the national news coverage has sparked concerns among pregnant women and their partners—as well as their extended family and friends. In this video, David Schonfeld, MD, FAAP, a developmental-behavioral pediatrician and director of the National Center for School Crisis and Bereavement (NCSCB) and Carolina Peña, MD, FAAP, a developmental-behavioral pediatrician at Kaiser Permanente, West Los Angeles, provide expectant parents and their families with some basic information about the risks of Zika infection during pregnancy and recommends strategies to deal with stress if they are worried. Dr. Schonfeld and Dr Peña also address what expectant parents can do or expect if Zika virus infection is suspected or known during pregnancy. Pediatricians are learning more about Zika virus at the same time as their patients may be coming to them with questions. In this video, David Schonfeld, MD, FAAP, a developmental behavioral pediatrician and director of the National Center for School Crisis and Bereavement (NCSCB), provides 10 tips for pediatricians to consider when speaking with their patients who may have a child with Zika virus syndrome, or are worried about possible infection in their unborn child. The above text for the family video will also be include on the www.aap.org/zika page as well so that AAP members have access to both videos.